Sciatica is the Latin word for “pain down the back of the leg.” Sciatica is referred pain usually caused by trapping the sciatic nerve in the lower back. The sciatic nerve runs from the lower back down through the buttocks and along the back of each leg. Sciatica is pain along this nerve and is a relatively a common form of back pain, usually caused by pressure on the sciatic nerve from a herniated or bulging disc. The pain from sciatica can be anything from infrequent and irritating to severe and debilitating. Usually, it affects only one side, a painful sensation radiating through the buttock and down the leg, and is often associated with a constant ache on one side of the buttocks and leg that can be worse when sitting. A sensation of burning or tingling down the leg, weakness, numbness or difficulty while moving the leg and foot makes it difficult to stand up. While sciatica can be extremely painful and uncomfortable, it is rare that permanent nerve damage (tissue damage) results from it. Most of the pain is due to inflammation and will improve within a period. Nerve pain is caused by a combination of pressure and inflammation on the nerve root, and treatment is centred on relieving both of these conditions. Typically, sciatica is made worse by bending, lifting, sneezing, and coughing. Sciatica is a common problem for manual workers, sedentary office workers, and is particularly prevalent during pregnancy. 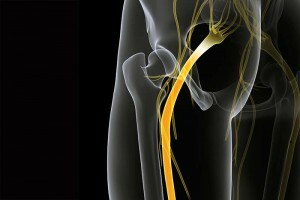 The sciatic nerve is the main nerve in the leg and the largest in the body. It runs from the base of the spine, along the back of the thigh to the knee, where it divides into branches. Sciatic pain is usually caused by compression of this nerve root at the point where it leaves the spine. Damage to the nerve can also cause pain. Among young and early middle-aged adults, the most common cause of sciatica is a prolapsed inter-vertebral disc in the lumbosacral area of the lower back. Among older people, changes in the spine due to conditions such as osteoarthritis may be responsible either by causing localised pressure on the nerve or by narrowing of the spinal canal – called spinal stenosis. Other bone disease or local injury may also be responsible. Spinal compressions due to osteoporosis.